Here we go! 2012-13 season gets underway! New faces in old places for some. Old faces in new places for others. Whatever the faces and wherever the places, it’s the start of another exciting season of girls basketball here in the great hoops state of Indiana. What does the season hold in store? Here are a few thoughts. Let’s start out with the easy ones. We see a battle royale brewing at the southern end of the state between two of the state’s top teams – Lawrence North and Columbus North. Lawrence North has a stable of super quick talent, including senior forward Mikale Rogers (left), junior point guard Ana Owen and sophomore forward Mina Cooper. The Wildcats are poised to build upon last season’s success, which included an 18-4 record on the way to a sectional title, their first since 2009. New head coach Chris Griffin will be Rogers’ third coach in four years; but despite the coaching changes, this team will be expected to produce a good tally in the W-column this season. We don’t see Lawrence North getting tripped up along the way to a semi-state showdown with Columbus North, but if it happens, it will be in Sectional 11 (Avon, Ben Davis, Brownsburg, Decatur Central, Perry Meridian, Pike, Southport). 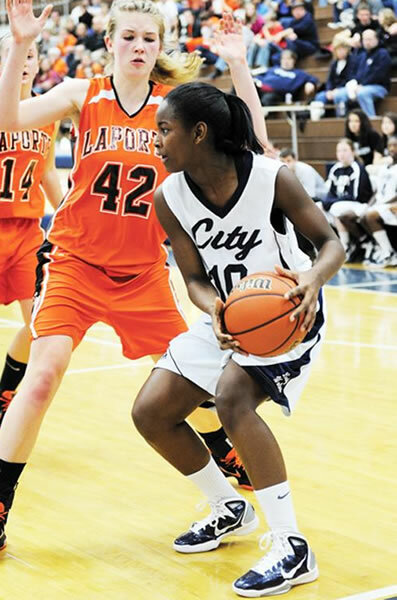 Don’t count out: Pike (Brittany Ward) and Brownsburg (Stephanie Mavunga). LN will need to put together their best efforts to develop as the season reaches tournament time in order to deal with what may be the best team in the state entering the new basketball season, Columbus North. The Bulldogs will also be looking to build on a very successful season with a young roster that did not include a single senior in 2011-12. Ranked just 11th in the state at the end of the regular season, Columbus North surprised with a tournament run that ended on the floor of the 4A state finals championship game, losing by just 2 points to North Central. Led by team MVP and rising sophomore Ali Patberg (right, 12.9 ppg, 5.8 rpg, 3.9 apg), the Bulldogs are poised for another state title shot, which — this season — will not be surprising. Returning to aid Patberg are seniors Quin Shoultz (6.1 ppg, 5.0 rpg) and Hanna Ballard (8.5 ppg, 3.9 rpg), together with sophomore guard Tayler Goodal (12.7 ppg, 6.2 rpg). The bench is deep for this team, which has a number of players who have accepted their roles to create a stronger whole. The North semi-state is a tougher one to predict. Michigan City — if this team of superb athletes can find their way onto the same page as their coaching staff — could be the leading contender in the north. The Wolves should return the services of their entire roster from last season, together with emotional team leader Aubria Clifton (left, ACL last season). Seniors Toni Murphy (18.6 ppg), Jameka Collins (10.9 ppg), Keshayana Cooper (11.7 ppg) and Clifton (9.4 ppg), will be shooting for their last chance to do something big as the class that was supposed to put the Wolves program back on the state map. Throw in the capable services of up and coming sophomore star Michal Miller (12.6 ppg), and you have a balanced attack to contend with. The only thing that might hurt the Wolves is their schedule. Still stuck in the Duneland home-and-home schedule, MC might not get the high level of competition they need to hone their game prior to the tournament. Penn, which eliminated Michigan City last season, returns a fairly solid group with seniors Taylor Lutz (8.5 ppg) and Olivia Carlton (10.1 ppg), but lost 24.7 points to graduation. D-I prospect post Caroline Buhr (11.4 ppg) will also be returning, but is coming off of a summer ACL injury which may limit her effectivness early. Things may be rocky for the Penns(wo)men at the start of the season, but they most likely will be the hurdle for the Wolves will need to clear before getting a shot at a semi-state title. Don’t count out: Merrillville (Victoria Gaines), Elkhart Memorial (Khadijah Moore, Monica Jones), Warsaw (Lindsay Baker). With the new sectional alignments last season, Indianapolis area teams North Central and Southeastern Hamilton find themselves in the “new north” half of the IHSAA tournament bracket. Great news for avoiding strong southern opponents, except for the fact that both NC and HSE are in Sectional 8. Defending 4A state champ North Central, led by Dayton recruit Celeste Edwards (12.8 ppg, 4.3 rpg), returns with a depleted squad, losing 25.0 points and, more importantly, 17.8 rebounds per game. Senior 6’1 swing player Jasmine Falcon (7.1 ppg, 3.1 rpg) will most likely be asked to take on a larger post role this season, but post play will be North Central’s Achilles heel, which their sectional partner HSE will be looking to exploit early and often. SE Hamilton has Miss Basketball contender Taya Reimer and fellow senior post Jessica Pongonis to build around, but with the loss of premier point guard Jordin Alexander to graduation, who will fill backcourt duties in a way that keeps defenses honest? Will we see Reimer taking more of a backcourt role this season? (She is certainly capable in that role.) Lots of questions surround how good the Royals will be this season,but they still could find themselves at the Northern Semi-State in February. Whichever team makes it out of Sectional 8 will probably have to contend with likely Fort Wayne representative Southside, led by Arianna Simmons. Simmons has a solid supporting cast, including junior forward Brittni Clopton (10 ppg, 5.8 rpg). 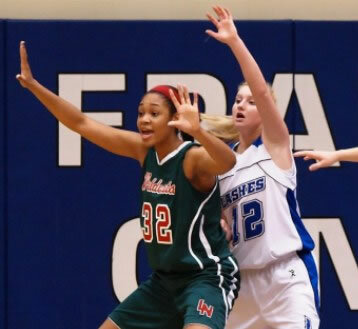 Don’t count out: Fort Wayne Snider (Meredith Shipman), Homestead (Emily Bley), Westfield (Jenn Anderson)..
After a total toss-up among a slew of contenders throughtout the entire 2011-12 season for who would wear the coveted No. 1 jersey, this season appears to be a definite two-horse race, with a solid backup field of studs. Barring any type of in-season injuries, it will be a neck-and neck affair between Brownsburg super power forward Stephanie Mavunga (North Carolina) and Hamilton Southeastern fantastic, versatile wing Taya Reimer (Notre Dame) . Both have already been showered with a bevy of in-state and national honors, but which player will be able to hoist her team on her back during the IHSAA tournament? That might be the deciding factor in this race. Mavunga, a 6’3 power-post leader, averaged 21.6 points, 12.4 rebounds, 5.1 blocks, 2.4 steals and 1.5 assists per game last season, leading the Bulldogs to an 18-3 record before falling to perennial power Ben Davis in the first round of sectional play. The Bulldogs rely heavily on the services of Mavunga, but the supporting Bulldogs cast has improved as a team over the past two seasons under the guidance of head coach Amy Brauman. But Mavunga is still the nuclear core of this team. What type of impact has Mavunga made at Brownsburg? 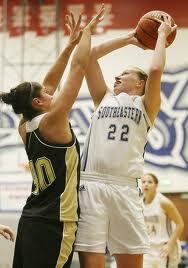 Prior to her arrival on varisty as freshman, the Bulldogs posted a 4-17 record. Since lacing up her Nikes for Brauman, Mavunga has improved the Bulldogs to 59-14 over the past three seasons, producing a best 3-loss campaign for Brownsburg last season, besting a 4-loss outing for Bburg in 2000-01. Getting out of Sectional 11 won’t be easy for Mavunga and her squad, Ben Davis has eliminated Brownsburg the past two seasons in sectional play, but come February, Pike, Southport and Ben Davis could all play spoiler for Mavunga’s final high school season. If Mavunga wants a chance of wearing No. 1 in June, she will need to stay out of foul trouble and her pack will need to provide a more balanced attack in order to advance in the tournament. 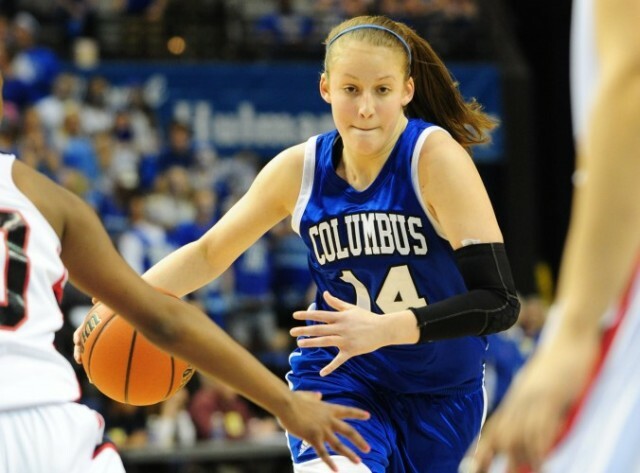 Reimer, a 6’2 swing player with tremendous versatility, averaged 19.4 points, 9.6 rebounds, 2.5 assists, 1.5 steals and 2.3 blocks per game as a junior, leading her team to a 20-1 record, that one loss coming in a first-round sectional shocker. Reimer’s team found themselves cleaning out their lockers much earlier than expected last season after a stellar undefeated regular season. Like Mavunga, Reimer will be the central focus of coach Chris Huppenthal‘s game plan for the 2012-13 season, but fellow postmate Jessica Pongonis will take a lot of the heat off of Reimer. Although an imposing presence for the Royals in the paint, Reimer may be spending more time on the perimeter this season, where she can be as effective as in the post. That is the beauty of Reimer’s game. She can take smaller guards off the dribble and maneuver around slower players in the paint. If neither Mavunga or Reimer make a deep run in the tournament, the deciding factor for Miss BB voters may be the head-to-head performances of both when the Bulldogs travel to HSE on November 28.